This titillating tidbit appeared as a breaking news item on Bloomberg and then was widely posted around the blogosphere, exciting quite a bit of speculation for such a tiny piece of information. Some outlets even wondered if this meant that China was preparing for a new gold standard. Speculation about China's newfound lust for gold is not altogether unwarranted. After all, I have noted myself on several occasions the incredible rate at which China is buying and importing gold at the moment. We have also noted that the official Chinese gold holdings of around 1000 tonnes are woefully out of date by now and likely to be 3 or 4 times that amount (some speculate 7,000 or even 10,000 tonnes is the correct figure). But that it is preparing for a new gold standard is not the most likely conclusion at this point. And it certainly isn't warranted from the actual article in question. What this (computer-generated) translation indicates is that Yudong in particular (and, as we shall see, the PBOC in general) is not interested in returning to a gold standard. In fact, the article goes on to specifically argue that the IMF's Special Drawing Rights (SDRs) should become the “anchor” in the “new Bretton Woods” system. SDRs are IMF-administered assets that can be used as foreign exchange reserves. They were originally intended to help ease the gold liquidity crunch that happened in the 1960s as the number of dollars in circulation exceeded the amount of gold backing them up, and the official Bretton Woods-specified rate of US$35 to an ounce of gold began to break down in international exchanges. It is not a currency itself so much as a claim that a central bank can hold on one of four currencies: the Euro, the yen, the pound or the US dollar. This “basket” of currencies determines the value of an SDR, and spreading this value out over four major world (fiat) currencies supposedly provides the “anchor” that the gold standard can no longer provide in this age of never-ending liquidity. This puts China's recent gold-lust into perspective. 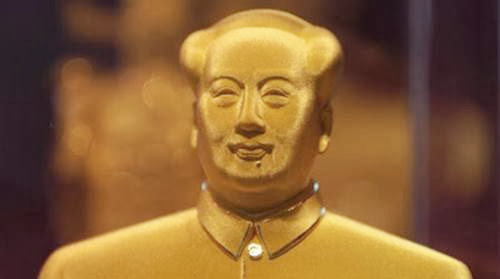 They are not trying to create a new gold standard, or tie the yuan to gold in some convertibility scheme. They are trying to gussy up their financial bona fides to get the yuan added to the SDR basket during its next reevaluation in 2015. Increasing their gold holdings to as much as (or more than) the US' (claimed) 8,000 tonnes would certainly be an impressive feat, and one that could give them legitimacy in the eyes of the international central bankster community. Sadly, unlike the people who saw the one sentence summary of Yudong's essay and surmised that China may be about to pull the plug out from the bankster's QE bathtub, it seems that they're playing ball after all and just angling for a spot on the roster. This type of wild mis-reading of the situation is perhaps to be expected. Despite its increasing importance in international economics and finance, few observers outside of the specialists who devote themselves to studying China's growing economy understand much about it or the people behind it (let alone can actually read the articles and essays in the original Chinese). This has led to a worrying situation. Much speculation is bandied about with regards to China's economy. Many thousands of gallons of printer ink (or its electronic equivalent) have been spilled dissecting the latest Chinese GDP estimates or manufacturing figures. Much debate has taken place among the bloggers and talking heads about how China will or will not act to upset the global economy in the coming years. But how much of this is informed speculation, and how much is based on second or third-hand (mis)interpretation of poorly translated—or even completely fabricated—information? Take the GDP numbers, for instance. Much has been made about China's supposed slumping GDP, with growth slowing to 7.5% in the first second quarter from 7.7% in Q1. All of this seems comfortingly precise (to a tenth of a percent, no less), but where do these numbers come from? Why, from the National Bureau of Statistics of China (NBSC), of course. And for those who find the flagrant doctoring of the CPI and unemployment figures in the US to be over the top, they should be especially wary of the NBSC. As I pointed out in my recent appearance on RT, the irony is that the same Li Keqiang who is now reassuring markets that the Chinese government is working on economic reform is the exact same Li Keqiang who was quoted in a leaked 2007 diplomatic cable as saying that China's GDP number was “man-made” and unreliable. In fact, the only economic data he actually trusts and uses to gauge China's actual economic growth (according to the cable) are electricity consumption, rail cargo volume and bank lending. So all of the talk, speculation, and hand-wringing over the latest GDP figure is really hype over a man-made number that even the current Premier of the country doesn't take seriously. Another example of the NBSC's fakery was exposed in a recent paper by Christopher Balding of Peking University. The paper, entitled “How Badly Flawed is Chinese Economic Data?” makes the case that real annual CPI in China “should be adjusted upwards by approximately 1%” thus reducing Chinese GDP by 8-12% “or more than $1 trillion in PPP terms.” One of the telltale signs of this manipulation is in the housing data. Despite a massive influx of rural Chinese to the coastal cities over the past decade, rural home prices are supposed to have grown three times as fast as urban equivalents from 2000 to 2011. The statisticians are playing with the numbers to hide the true rise in housing costs in order to artificially suppress their (made up) CPI numbers and artificially inflate their (made up) GDP numbers. The extent of the problem should start to become apparent. Arguing about Chinese GDP or CPI numbers is a pointless activity, and yet much of the media's attention is focused on preciesely that. Meanwhile, the real story can be seen in events like the credit crunch that we've been talking about in recent months, and the inter-bank lending rates that are one of the statistics that the central planners aren't able to keep under wraps (especially when cash starts drying up and people can't draw money from the ATMs for a day or two). In short, the Chinese economy has undoubtedly grown (and grown substantially) over the past decade. But the true extent of that rise has been greatly exaggerated by the Chinese government and an ill-informed punditry continues to be only too happy to play along with that deception. The last four years of growth has only been maintained by easy government-supplied liquidity, and now that the PBOC seems to have realized the dangerous bubble they have blown (and the risky “wealth management products” and other MBS-like assets that have been created as a result), they are trying to find a way to turn off the liquidity without collapsing their banking system in the process. This is the real story of China's economy today, and one only receives hints of it in the mainstream financial media.